I am gardening by the thermometer and tradition this year, rather than by the calendar. My Good Neighbor always told me that St. Patrick’s Day was the traditional day to plant peas, but for the past three years, I worried that the ground was too cold, the weather too damp, and the Fates just not conducive to planting so early. So I waited for the calendar to turn at least one more page. Not this year. It has been so warm that I almost wonder if I am planting my peas too late! I planted them on St. Patrick’s Day this year, pleasing both Neighbor and my common sense. 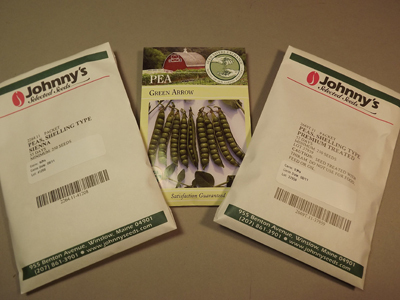 The early variety is from Johnny’s Selected Seeds, and is “Premium.” The vines grow up to 30″ and may be grown with or without support. This year I plan to try using brush to support the vines, again with Neighbor’s advice to guide me. The mid-season variety is “Sienna,” also from Johnny’s Selected Seeds, and I’m told that the vines are relatively short but set heavily for a high yield potential. I am hoping this encouraging description comes true! The late variety is “Green Arrow,” from the Seed Saver’s Exchange. Besides the later maturation, these peas are smaller than Premium and Sienna, and bear 1-3 more peas per pod. All attractive qualities. As I did last year, to thwart the marauding chipmunks, I planted my peas and then covered them with recycled milk jugs. These homely-but-effective cloches provide a bit of warmth and a lot of camouflage for the emerging plants. Once the peas are a few inches high, I will remove the cloches, and replace the jugs’ anchoring sticks with brush or some other form of support. It was astounding both to Husband and myself that I still don’t have enough milk jugs. I have about 15 seeds planted, but not covered. They are marked with small rocks, to cover as soon as we drink our way through gallons of milk. I am setting out a box of Carnation Instant Breakfast on the kitchen counter as a subtle hint for family members. 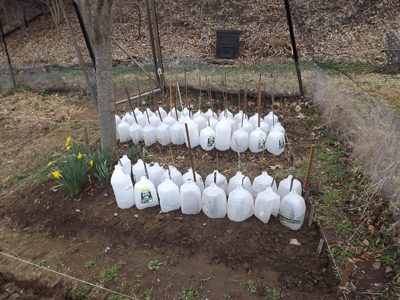 Once the peas are established and the jugs are removed, I will only be a few weeks away from putting the jugs back into service to cover my bush green beans and shelling beans. -The United Kingdom is the largest producer of peas that are used for freezing, in Europe. -One serving of freshly frozen peas has more vitamin C than two large apples. -In 1533, Catherine de Medici supposedly took Italian peas, known as “piselli novelli,” to France when she married Henry II. -In the 19th and 20th centuries, the thick London fogs were called “pea-soupers” because of their incredible thickness (density) and their slightly green color. – Clarence Birdseye froze the first peas in the 1920’s. -Janet Harris holds the world record for eating peas. In 1984, 7175 peas were consumed one by one in 60 minutes using chopsticks. Source: http://www.bioweb.uwlax.edu, a collaborative website produced by faculty members of the University of Wisconsin. — Best Cooking Pulses, Inc.